Speed_of_Current_Change = U / L.
Please forgive me the mental shortcuts, but I am trying to describe a nontrivial physical phenomenon to the non-technical reader, that may be willing to understand. Looking at this modified formula, you can see that the speed is inverse proportional to the inductance, meaning that: the ***BIGGER*** an INDUCTANCE is, the ***SLOWER***, or more inert, is the capability of the ***Current*** to rapidly change it’s value. And vice versa: the ***SMALLER *** the INDUCTANCE is, the *** FASTER ***, or less inert, is the ***Current*** in it’s capability of rapidly changing it’s value. It is the change of CURRENT that moves your speakers. It is NOT the change of VOLTAGE that moves your speakers. As can be clearly seen (source: http://en.wikipedia.org/wiki/Lorentz_force), the force that moves the membranes of your speakers is a function of ***CURRENT***, and not a function of voltage. Now, for reasons that are totally not understandable to me, the whole industry (99,999999% give or take ?) produces amplifiers, that are voltage output amplifiers, with a LOW output impedance, as close to the “ideal” zero as possible. 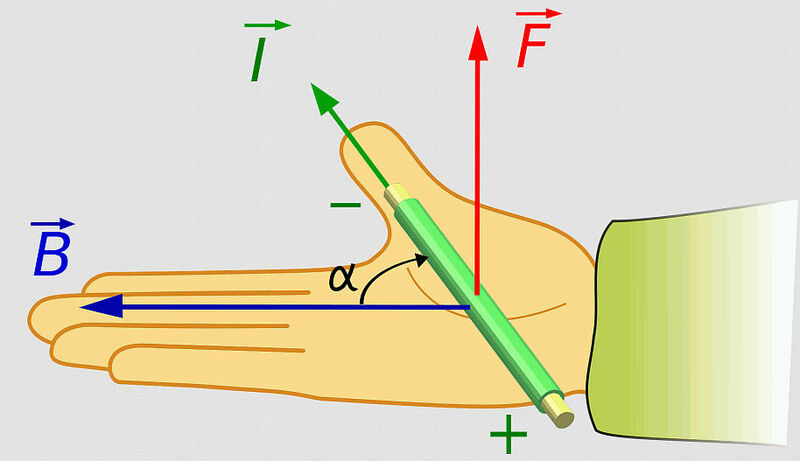 Meanwhile, it suffice to recall some basic lessons in physics that we had in high school, or even have a brief look at that right-hand-rule reminder picture, to recall that the force working on a wire (such as the coil of your speaker’s membrane) placed in a magnetic field …. 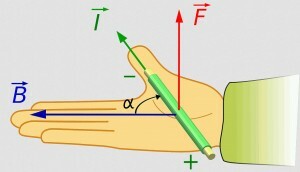 is a function of the magnetic field strength and of the CURRENT ( … and ***NOT*** the voltage). It is hence only logical, that 99,999999% of the audio industry, producing amplifiers, … has got it all wrong. The output of an amplifier should logically be a CURRENT output. To make this even more controversial … such an output should have a close to INFINITE output impedance. But whatever. It is your problem, and not my problem. Some things I will simply never understand. Before you laugh me out loud, try looking into this valuable piece of literature here: http://www.current-drive.info. Your DIY V-cable is ULTRA FAST, perfectly conveying all the nuances of the music signal. If someone rapidly and suddenly hits a percussion – you get a sudden change of the voltage at the output of your amplifier. And by “sudden” I do not mean a “sinus” signal. Musical content is not a sinus signal, but a very complex pattern, one that has very high and steep slopes, every once in a while. If your cable is not capable to convey “sudden” changes of voltage into equally “sudden” changes in current – you simply start loosing the “details”, the “air” or the “precision” – as audiophiles like to call it. Low inductance === > very short pulse rise time ===> strong changes in current, where they are needed ====> rapid movements of you speaker membranes, when and where they are needed. But can I actually “hear” such a finesse difference ? Well, come on. Of course you can. It is a fine and subtle, but very recognizable “precision” in the exactness of the details you hear. It is a slightly blacker version of the black that is supposed to build the background. Obviously, … providing that all the other components of you audio system are of a good choice and work well with each other. You will hear unbelievable precision of details, nuances, more “air”. Even “things” that you never heard before. Things that were there, but were masked by the veil. Well, imagine that somebody “on the other side” hits a drum or slams a door. A measure of how high you jump from shock and astonishment, by the sudden impetus – this is a subjective measure of the “speed” of your cable. What about the capacitance ? Well, unfortunately, your cable may exceed a capacitance of even 5 nanofarads per meter. This “could” be perceived as bad news. But actually … it is not. (This is NOT an interconnect we are talking about here). Such a high capacity “could” potentially be a real pain in the output of many a mediocre amplifier. If the amplifier is weak and inefficient in terms of output current capability, it can be upset, or even fall into parasitic oscillations caused by our cable. This is not a real threat, but only a hint of a remote possibility. A risk. The remedy – the ZOBEL Network that I mentioned earlier. Looking at some of the final measurements that I performed on my ready cables, I immediately considered whether or not I should put Zobel Networks at the speaker ends of this cable. A Zobel Network is a simple device, consisting of two elements joined in series and attached between the speaker terminal lugs: a resistor of a value of 8 ohms / 5 watts, connected in series with a capacitor 220nF / 630V. If you want to play it safe, consider inserting such a network between between two speaker connector lugs. If you have terminals that accept banana plus, independently of screws, it is a good idea to connect two banana plugs to your Zobel Network and simply “plug it” into the banana sockets of the speaker terminals. Why? – the answer is “Just in Case”. In case of WHAT ? In case that your amplifier cannot cope with this cable. an extremely high self-capacitance (no free lunch, unfortunately). This capacity may in fact be considered as a “difficult load”. It may even destabilize the proper functioning of some of the weaker, or below average quality brands of amplifiers, the ones that cannot “produce” a sufficiently high instantaneous peak current, necessary to reload, or re-polarize the capacitances, should such a need arise. Such a weak output stage, if not designed properly, may fall into sonic or supersonic oscillations. If, when driving a “normal” speaker load, your amp is already on the verge of stability, then adding this high capacitance speaker cable may tip the whole equilibrium “over the tip of stability”, and the whole set will turn into a big oscillator. Your tweeters – rest in peace their tormented souls, for in case of such a “self-oscillations” scenario, they are the first to disintegrate. The Zobel Network shall remedy any and all potential instability, by constituting a low impedance shunt to ground for any ultra high frequency content, should such arise. It kills any such oscillations in the outset, by sheer low impedance to ground for the supersonic frequencies. The Zobel Network hence protects your tweeters from possible damage, that could occur if such high energy, high frequency oscillations would hit upon the tweeter with full force. The Zobel Network, whose time constant falls decisively above the upper limits of the audio band, does not hurt the audio broadcast that you are listening to, but at the same time prevents your amplifier from misbehaving. As for the optional Zobel capacitor, consider a quality polypropylene, something like “MKP” or “MKT” film type capacitor, of the better, renown brands, a cap with a value of 220 nF ~ 330 nF, connected in series with a resistor of 8~10 ohms, one of considerable power. The resistor should be capable of handling about 5 watts or more. But there is good news to all this. But the good news is, that mediocre amps are scarce nowadays. I even think that the “really lousy ones” have simply ceased to exist. We live in an era in which such ‘utterly despicable’ amplifiers are few and far between. There is a good chance that your amplifier is more than perfectly capable of handling such a difficult cable, not to mention a bigger problem: capable of handling difficult speaker sets, which is a typical case, when you look at today’s speakers that are being sold. So, in practice, you do not need the Zobel Network. Practically nobody in the industry produces amplifiers, that would be lousy enough to fall into such problems. The quality of the equipment being sold is simply very high, so that the problem is a non-issue. Besides, all producers tend to play it safe, stay on the safe side, and hence market devices that are already adequately protected, equipped with additional protection circuits, that protect against both short circuits on the output, but also against such “oscillations” scenarios. I personally do not use the Zobel Network. No need. I strongly advise to pull the whole length of the V-cable into a nylon protective sheaf. These come in various colors, but I personally chose the black ones. Such a sheaf – not only it increases aesthetics and the looks of the cable, but it also protects the fragile insulations of the individual, fairly delicate wires, from abrasions or other forms of mechanical tear and wear. We do not want “normal handling procedures” to cause a short circuit in the cable somewhere. Keep in mind those delicate insulations of the individual 24 AWG wires sitting inside there. After completing the installation of all the sheafs, the terminal lugs, the ferrite cores, or other accessories, please check again that there is no short circuit between the plus and minus lines of the cable. Use your Ohms-meter. Your speaker cable will have a performance comparable to the cables produced by some renown, commercial companies. I did some listening tests and comparisons with some commercial speaker cables, but I do not want to disclose their names. My measurements were conducted with a fairly professional capacitance meter and an inductance meter. And finally, one may ask: so how long did it take to make those cables ? I am a happy owner of a pair of 10 meter speaker cables. It took me two weeks to make them, by means of allocating 1 hour of my spare time in the evening and committing myself to the activity. And Yes, I do believe that it was worth it. If it was not the case, I would not bother to spend my time writing about it. The cable is “transparent”, clear. I would even dare say, … “as transparent as ….” – if you know what I mean. Lots of details. It is much easier now to close your eyes and start pointing with your finger to everyone on the stage, pointing at the locations of where every person is standing. With closed eyes, I can even see the approximate size and geometry of the room, or dwelling, where the recording is being made, where the “live” disc was recorded. The moment I heard Adel and that concert in the Royal Albert Hall – Wow ! Those lungs ! That SPACE ! That 3D imaging. Depth. Height. Width. The dimensions of that listening venue simply blew my socks off. A cable really worth the effort. Mathematics of the Reel, or how much is enough …. With a single cable reel of 305 meters you can produce about 25 meters of mono speaker cable, which corresponds to approximately 12 meters of a 3 x 3 x 3 stereo speaker pair. If you decide to purchase such a standard reel, and do so with two other of your colleagues – each of you has a chance of creating his own “stereo” pair of a length of 4.1 meters. It just so happens, that 4.1 meters is a length that is an optimal fit for a majority of living rooms – at least amongst those that I have seen in my area. Such a Reel for Three people seems to be a reasonable investment. The cost of such a cable, when cost sharing with two other guys, falls do approximately: 60/ 3 = 20 EUR per person. Did I mention earlier that my cables are 2 x 10 meters in length ? Does that not seem to you like audiophile suicide ? That such an excessive length of cable will kill the soul of the music ? What can I say. The soul of my music is by far not dead. It is alive and kicking, I would say. Despite such a potentially deadly length, the cables are as fast as lightning ( pun intended ). In general, you do “not feel” the excessive length of the cable. Nothing is muddled. Everything is Cristal Clear. Maybe I have not heard too much in my life … but what I hear – I simply love it! After extensive listening, after some blogging, someone raised the issue that I am ignorant in terms of measuring apparatus and that I simply misread what the meter device was displaying. So there I go again. Just to be sure … I conduct my measurements again. The readout takes place on the smallest possible range of the UNIDEN UNI-T series UT-602 measuring instrument. The smallest range is 2 mili-henry ( = 2000 micro-henry), displayed by means of 3,5 significant digits, i.e. “+/- 1999”. The readout was about 1.7 micro-henry … but for the entire length of my cable, spanning slightly over 10 meters. Hence, to obtain a “per meter” readout, we divide this number by 10, and obtain a result of 170 nano-henry per meter. For those that are unfamiliar with the metric system, this roughly corresponds to a value of 56 nano-henry per foot. Yes, you have to see it in order to believe it. Oh, and by the way, the more you braid, the lower it falls (= the better it gets). If you were to create a monster – the likes of a 3 x 3 x 3 x 3 …. I would expect these inductance parameters to further fall in values … to less than a half of what I quoted. I wish to draw you attention to a **Table no. 2. on page no 2** of this extensive, multi page text. P.S. The article as above contains certain mental shortcuts and purposeful (and brutal) simplifications, so as to better “visualize” certain concepts, problems and issues. In my humble opinion, this simplified representation of physical phenomena is cruel, but justified, for the sake of clarity and keeping it “short”. This is not an attempt to provide classes on the theory of entry level electronics, but a layman belletristic visualization of some of the effects arising thereof, and how we can get some “action” and quick results without the boring maths.